Big Data & Data Science Blog: Artificial Intelligence: What even is that? Artificial Intelligence: What even is that? By Dr Richard Benjamins, VP for External Positioning and Big Data for Social Good at LUCA. Artificial Intelligence (AI) is the hottest topic out there at the moment, and often it is merely associated with chatbots such as Siri or other cognitive programs such as Watson. However, AI is much broader than just that. To understand what these systems mean for Artificial Intelligence, it is important to understand the "AI basics", which are often lost in the midst of AI hype out there at the moment. By understanding these fundamental principles, you will be able to make your own judgment on what you read or hear about AI. Figure 1: Artificial Intelligence: What even is that? This post is the first of a series of three posts, each of which discuss fundamental concepts of AI. In this first post, we will discuss some definitions of AI, and explain what the sub-fields of AI are. What are the most common definitions of AI? So, first of all, how does Google (one of the kings of AI) define Artificial Intelligence? Figure 2: A popular definition of Artificial Intelligence (Google). There are many definitions of AI available online, but all of them refer to the same idea of machine intelligence, however, they differ in where they put the emphasis which is what we have analysed below (an overview of these definitions can be found here). Figure 3: The official Webster definition of Artificial Intelligence. The above definitions portray AI as a moving target making computers perform things that, at the moment, people do better. 40 years ago imagining that a computer could beat the world champion of chess was considered AI. However, today, this is considered normal. The same goes for speech recognition; today we have it on our mobile phone, but 40 years ago it seemed impossible to most. On the other hand, other definitions highlight the role of AI as a tool to understand human thinking. Here we enter into the territory of Cognitive Science, which is currently being popularized through the term Cognitive Computing (mainly by IBM's Watson). "AI is everything we can't do with today's computers." AI can solve complex problems which used to be assessed by people only. What we consider today as AI, may just become commodity software in the not so distant future. AI may shed light on how we, people, think and solve problems. What are the sub areas of AI? 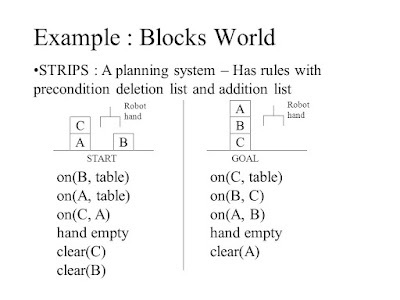 Looking at the introductory table of content of any AI textbook will quickly reveal what are considered to be the sub-fields of AI, and there is ample consensus that the following areas definitely belong to it: Reasoning, Knowledge Representation, Planning, Learning, Natural Language Processing (communication), Perception and the Ability to Move and Manipulate objects. But, what does it mean for a computer to manifest those tasks? Reasoning. People are able to deal with facts (who is the president of the United States), but also know how to reason, e.g. how to deduce new facts from existing facts. For instance, if I know that all men all mortal and that Socrates is a man, then I know that Socrates is mortal, even if I have never seen this fact before. There is a difference between Information Retrieval (like Google search: if it's there, I will find it) and reasoning (like Wolfram Alpha: if it's not there, but I can deduce it, I will still find it). Knowledge Representation. Any computer program that reasons about things in the world, needs to be able to represent virtually the objects and actions that correspond to the real world. If I want to reason about cats, dogs and animals, I need to represent something like isa(cat, animal), isa(dog, animal), has_legs(animal, 4). This representation allows a computer to deduce that a cat has 4 legs, because it is an animal, not because I have represented explicitly that a cat has 4 legs, e.g. has_legs(cat, 4). Planning. People are planning constantly: if I have to go from home to work, I plan what route to take to avoid traffic. If I visit a city, I plan where to start, what to see, etc. For a computer to be intelligent, it needs to have this capability too. Planning requires a knowledge representation formalism that allows to talk about objects, actions and about how those actions change the objects, or, in other words, change the state of the (virtual) world. Robots and self-driving cars incorporate the latest AI technology for their planning processes. 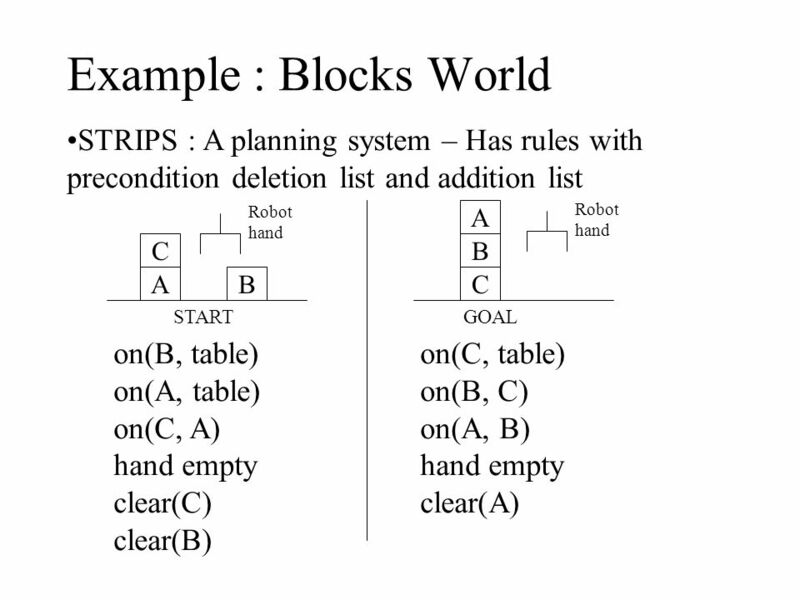 One of the first AI planners was STRIPS (Stanford Research Institute Problem Solver), that used a formal language to express states and state-changes in the world, as shown in Figure 3. Figure 4: The STRIPS planner to build a pile of blocks. Learning. Today this is probably the most popular aspect of AI. Rather than programming machines to do what they are supposed to do, machines are able to learn automatically from data: Machine Learning. Throughout their life, and especially in the early years, humans learn an enormous amount of things, such as talking, writing, mathematics, etc. Empowering machines with that capability makes them intelligent to a certain extent. Machines are also capable of improving their performance by learning by doing. Thanks to the popularity of Big Data, there is a vast amount of publications on Machine Learning, as well as cloud-based tools to run ML algorithms as you need them, e.g. BigML. Natural Language Processing. We, humans, are masters of language processing since communications is one of the aspects that make humans stand out of other living things. Therefore, any computer program that exhibits similar behavior is supposed to possess some intelligence. NLP is already part of our digital live. We can ask Siri questions, and we get answers, which implies that Siri processes our language and knows what to respond (oftentimes). Perception. Using our 5 senses, we constantly perceive and interpret things. We have no problem in attributing some intelligence to a computer that can "see", e.g. can recognize faces and objects in images and videos. This kind of perception is also amply present in our current digital life. Move and Manipulate objects. This capability is above all important for robotics. All our cars are assembled by robots, though they do not look like us. However, androids look a bit like us and need to manipulate objects all the time. 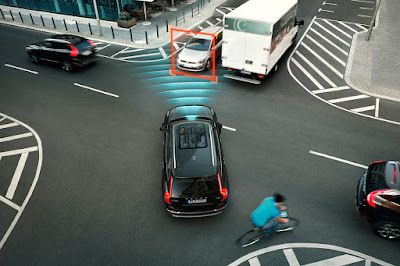 Self-driving cars are an other clear example of this manifesting this intelligent capability. Figure 5. Self-driving cars combine many capabilities of Artificial Intelligence. 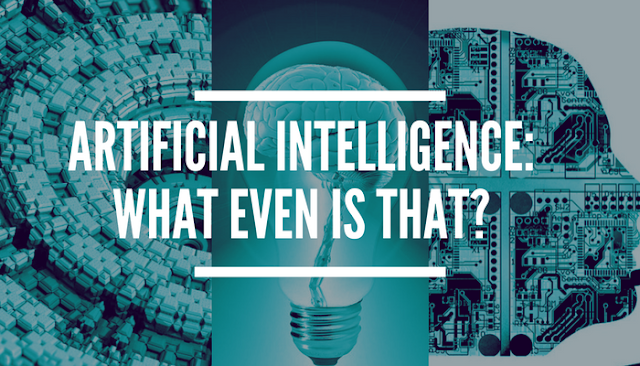 In this first post (of three), we have explained some key notions about Artificial Intelligence. If you couldn't do so before, you will now be able to read AI publications a bit differently. In the next post, we will elaborate on the question of how intelligent AI can become. Stay tuned! I think that its interesting at what number of individuals are mistaking understudies for words like on the off chance that you cheat you will get got. Truth be told, that is not how the framework functions. Against literary theft programming, for example, Turn tin isn’t right and does not know custom Essay Star | Essay Writers UK. Utilize an administration that does not present their shoddy written work expositions to hostile to literary theft sites on the grounds that those sites keep a duplicate of the articles checked. You need a paper composed for you and no records of it remaining at any rate to guarantee nobody will discover.